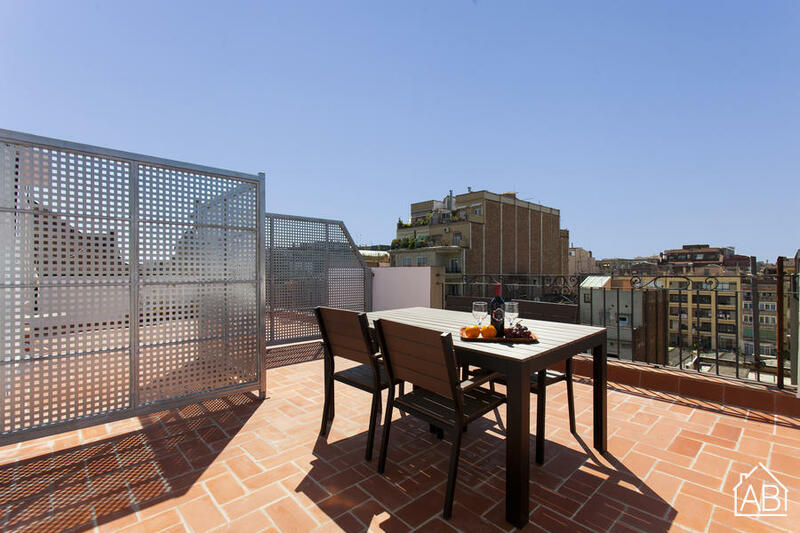 This centric apartment can be found right in heart of the Eixample Left district, only a 10 minute walk from Plaça Catalunya and many more of Barcelona’s sights. The access to the public transport is excellent in this area, and there are many bus and metro stations nearby so you can reach all parts of the Catalan capital easily. You’ll find lots of fantastic restaurants, bars and cafés surrounding the apartment, as well as plenty of supermarkets. The location is simply ideal for those looking to make the most of their time in Barcelona. The apartment is comfortably furnished, and can sleep up to 5 people. This is a great place for families or groups of friends. What’s more you’ll have access to a private terrace with a lovely view and a table and chairs where you can enjoy your meals ‘al fresco’ or soak up the Spanish sun. There is an open plan living-dining area, and here you’ll find a cozy sofa and a TV, the perfect place to kick back and relax after a long day in the city. The kitchen comes fully equipped with everything you need to prepare your favourite meals or try out some new Catalonian dishes. There are 2 bedrooms in total, with one double bed, one single bed and one double sofa bed distributed throughout the apartment. There’s a washing machine and a dishwasher for your convenience, as well as an internet connection which makes it perfect for those who need to work, study or simply stay in contact with family and friends. There is also an elevator in the building.